I have become somewhat comfortable with different stereo techniques even though I still have very much to learn and even more to master. 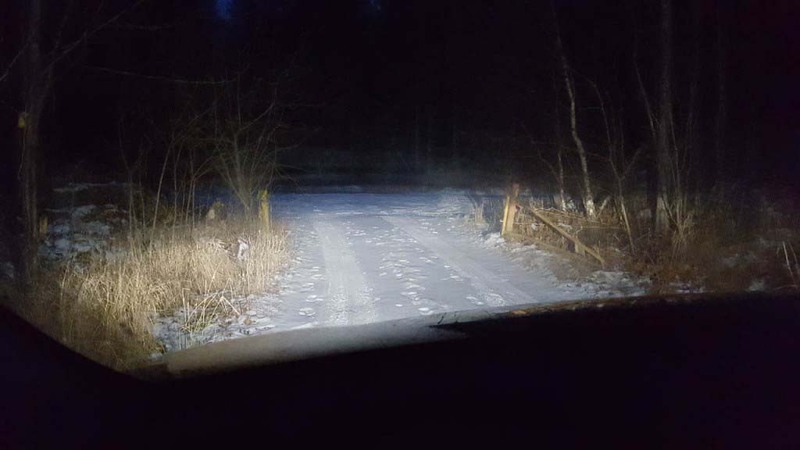 I took the opportunity to purchase a variety of fireworks and rigged an array of microphones in a somewhat remote location while it was still daylight on new years eve. 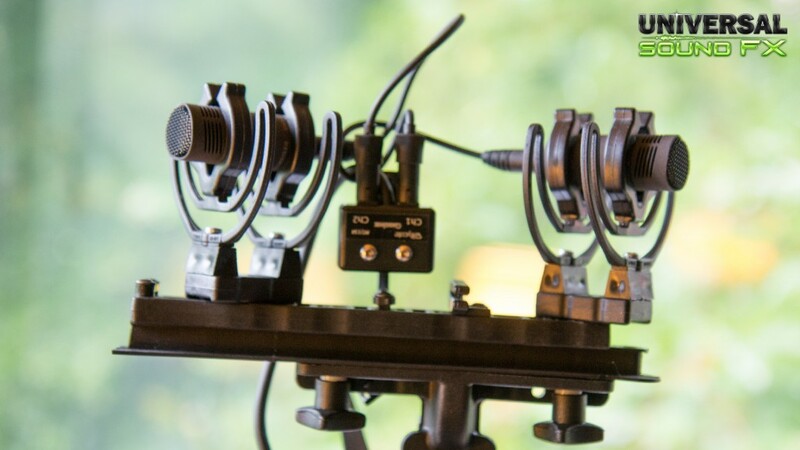 In total I brought 10 microphones that I placed in different stereo and mono configurations ranging from a fairly close distance of 25 meters, to a remote distance of 100 meters. It will likely come a time when I write a full post about the fireworks field recording session but for now I'd like to focus on two pair of microphones in particular; a pair of Sennheiser MKH 8040 cardioid microphones arranged in the ORTF (Office de Radiodiffusion Télévision Française) stereo configuration, and a mid-side (M/S) setup consisting of a Schoeps CCM41 supercardioid and a Schoeps CCM8 figure 8 microphone. 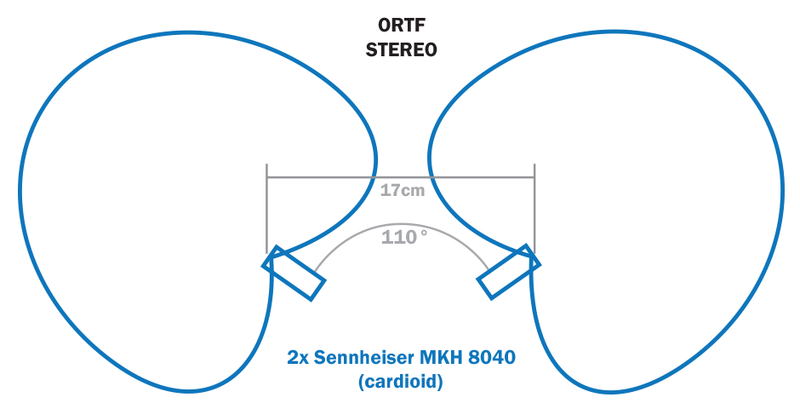 Most of my stereo recordings so far have been ORTF recordings which is probably the simplest configuration to grasp. 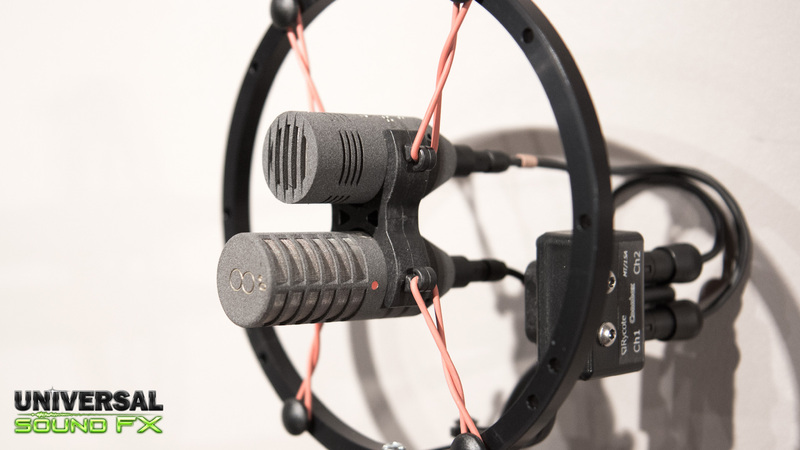 Basically, it is two identical cardioid microphones that are spaced 17 cm apart and angled 110 degrees from one another, which sort of mimics the way human ears work. The upsides to this configuration is simplicity and a nice realistic stereo width to the sound. The downsides, on the other hand, are that 1) there is no microphone pointing straight ahead so a good mono recording in center field will be missing, 2) there may be phasing issues when the stereo recording is mixed down to mono (i.e. the left and right channels may be cancelling each other out to some extend since the microphones are spaced apart) and 3) the stereo width is final, you can't really make it narrower or wider by post processing. Despite its downsides, I like ORTF because it sounds great for stereo ambiences which is mainly what I use it for. In such cases I rarely require a mono channel facing forward (e.g. forest, beach, city, public places) and to avoid phasing issues all together, for a good mono sound, the simple solution is to just use the left or right channel single as mono. There are many cases, however, where the idea of capturing mono compatible and directional audio would be ideal. The Mid - Side (M/S) stereo technique allows this and as an added bonus, you can even decide how wide you want the stereo to be after the sound was recorded. Throw the idea of how human ears work aside for a moment. The M/S technique uses two different types of microphones. A front facing "mid" microphone (cardioid, omni, or in my case, a supercardioid) captures whatever sound it is aimed at in mono. A second figure 8 "side" microphone located directly above or under the mono microphone captures sounds to the left and the right. The M/S technique scared me for a while since the captured audio isn't compatible to play back without first being processed. The raw M/S audio is "encoded" which means that the raw audio captured from M/S contains the center audio in the left channel and the side left/right audio in the right channel. This material won't play back correctly without first decoding the audio to standard left/right stereo. There are different tools and methods to perform the decoding. At a basic level, the mid channel (usually the left channel of the encoded audio) is treated as mono resulting in being identical in the left and right channel of the final decoded stereo audio file. 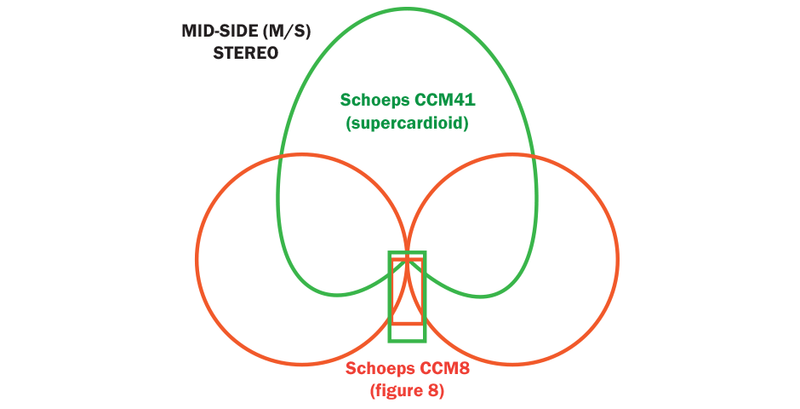 The side channel (usually the right channel of the encoded audio) is treated by being converted into stereo audio where the right channel is phase inverted. Once the side channel has been prepared it can be mixed with the mid channel and depending on the amount of mixing you can make the resulting stereo file anywhere from very narrow to very wide. Once you have performed the M/S decoding a few times you'll learn that there is no rocket science or magic going on. The great flexibility of M/S does, however, come with some downsides. Decoded M/S files can't be used as any old recording without first being processed, and if sold as part of a library, you have to be extra clear to point out that the audio is M/S encoded and what the consequences of that are. A way around this is if you first decode the audio, maybe into a narrow, and wide version, for distribution or inclusion in an sound effects library. You still have the great advantage of selecting the stereo width after the audio was recorded. The audio example above contains first the ORTF recording, followed by the M/S recording decoded with 50/50 with side channel for a wide image, and the final section is a mix between the two. 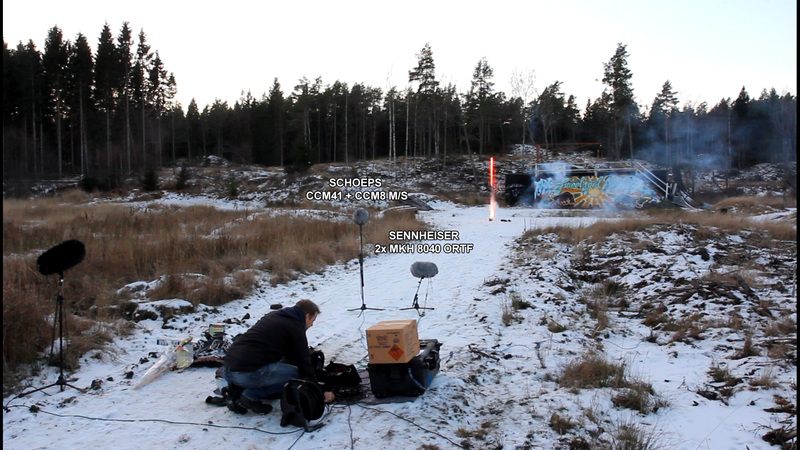 During my fireworks field recording session, I had my Sennheiser MKH 8040 ORTF setup and Schoeps CCM41+CCM8 M/S setup, located in the same place, both aiming towards the fireworks with a slight angle up into the air. I recorded the 4 audio channels into the same Sound Devices 788T recorder at 192 kbps/24 bits. I set the gain conservatively not to clip the peaks and the limiter was disabled. This was a deliberate choice because I didn't want the limiters to alter any audio and I was hoping there would be enough quality and room to raise the gain with a faster post limiter to remove the extreme peak audio without having a sweeping effect on the following echo tail. In post, I first normalized the audio which increased the gain by about 5dB. I then ran a maximizer plugin increasing the volume by another 35dB while limiting the peaks. This is a substantial increase in dB and the noise floor was raised in the process. I was quite surprised at the difference of the two recordings. The Sennheiser pair picks up much deeper bass frequencies and the Schoeps setup is much "snappier" and sharp but lacks those deep frequencies of the Sennheiser mics. I also feel that the ORTF recording lacks a bit in the center and the width of the M/S recording feels nice. Mixing the two together is the closest representation of what I recall actually hearing on site.